A reduced schedule on Remembrance Day weekend. Two Premier games on the Island the Vikes hosting CW under the lights on Friday evening and Westshore travelling up island to Nanaimo for a Saturday afternoon fixture. A match littered with yellow cards (5) and penalties by all accounts killed any flow to the match. CW are now tied with Burnaby for second place behind UBC while the Vikes remain in 8th place. The match report from UVic below. 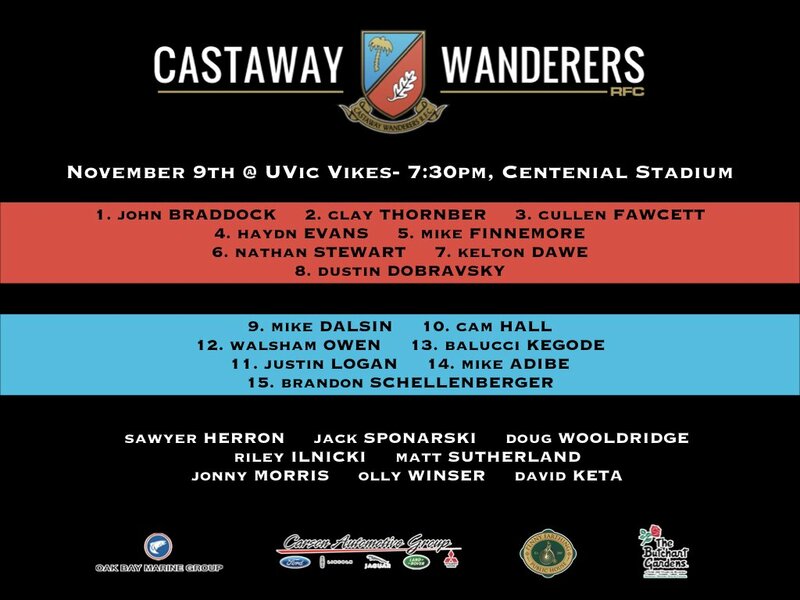 VICTORIA- The Castaway Wanderers were awarded a penalty try in the 77thminute to claim victory over the University of Victoria Vikes by a final score of 12-7 in a thrilling match under the lights at Centennial Stadium on Nov. 9. The victory keeps the Castaway Wanderers undefeated on the season, improving to 5-0. The loss drops the Vikes to 2-4 in the B.C. Premier league standings. "It was a tough and physical game tonight," said Vikes head coach Doug Tate. " We definitely did enough to keep ourselves in that game but some unfortunate injuries caused our scrum and other set pieces to fall apart at the end." The tension was high between the Vikes and Wanderers as a total of five yellow cards were handed out in the match. "There were a lot of penalties for both sides tonight," added Tate. "We took a lot ourselves which meant we struggled to keep possession of the ball." The home side took the lead in the 31stminute after the Wanderers had scored first in the 24th. Crosby Stewart picked the ball out from a ruck, found a hole and scored under the posts to give Gradyn Bowd the easy conversion attempt. The two sides played relentless defensive for the remainder of the game but knock ons from both teams kept the game at a score of 7-5 in favour of the Vikes until the late stages of the game. The Wanderers put together several phases just out side the Vikes try line but Victoria forced a turnover in the 58thminute to relieve the pressure. Moment's later, Castaway back Jonny Morris found a hole but was caught just in time with a shoe string tackle made by a Vike defender 10 metres out from the Victoria goal line. Gui Costa was sent off the field after taking a yellow card in the 74thminute and the ball was once again metres out from the Vikes goal line. However, a Castaway knock on gave the Vikes a chance to kick themselves out of danger in the 75thminute. Two minutes later the Wanderers forced what turned out to be the game-winning penalty try of a scrum deep in Vike territory. Down a man, Victoria drove the field in extra time to put themselves inside the Castaway 10 metre line threatening to score but the Wanderers gained possession of the ball and kicked into touch to secure the 12-7 victory. The Vikes have one final match at Juan de Fuca Park against the Westshore Valhallians next Saturday on Nov. 17 before they turn their focus on the Canadian University Men's Rugby Championships hosted by the Vikes at Centennial Stadium and Wallace Field on Nov. 21-25. The #8 Vikes host the #3 CW side. CW haven't lost a Premier game this season and a BP win would catapult them up to second place past Burnaby. The Vikes are building towards the University championships which they host later this month and put on a fine performance last weekend against James Bay in a convincing win on the road. The rain was pouring down in Victoria this morning and conditions under the lights will be slick, that may negate the anticipated advantage UVic would have out wide. 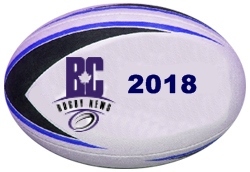 A few of the CW forwards have impressed in recent matches, Mike Finnemore at second row is a solid player who shows leadership qualities, Dustin Dobravsky seems to be playing a little more angry these days, good for CW, not so good for opponents. He didn't make the Canada squad at the repechage, despite being a regular with Canada A, and that may fuel some of the ire. Luke Bradley is out for CW after picking up an injury in the last match, he's been playing well lately. For the Vikes their halfback combination of Stewart to Bowd is top drawer. Lockie Kratz and Nicholas Carson received special mention in their last outing against James Bay. My gut says Vikes at home in the stadium, my mind says don't bet against the undefeated side. Prediction: CW by 2. Nanaimo led at the half 13-6 with two tries and penalty to 2 penalties for Westshore. It was all Westshore in the second half however with 3 tries. The result puts Westshore into 11th place with 9 points, one ahead of Lomas while Nanaimo hold on to 10th place with 10 points. Next week Westshore host UVic while Nanaimo have a bye. #10 Nanaimo host #12 Westshore. Nanaimo with their first win of the season last week against Seattle, a surprise upset. Westshore narrowly losing to CW at the whistle in their last match. Westshore minus the young Quinn Ngawati who left the Toronto Wolfpack rugby league side to return to union. We hear he is now part of the 7s program and not available for club XVs. We hope he gets to play rugby on a regular basis and doesn't get put on the shelf like Luke Bradley was for a couple of years. Westshore have Ryan Kotlewski back, another Canada A player who didn't make the repechage team. The Westshore loosies are a productive unit on both sides of the ball, Cole Mosychuk has been outstanding. Two Canada U20 players showing up for the first time in the centres Kevin Vertkas and Seth Purdey, that will make a difference. Nanaimo missing a couple of key players this week, their Scottish #10 Gillies and Jared Stephens their outside flyer. Prediction: Westshore by 4.